The Jacquard attachment for looms, developed in 1804, revolutionized textile production: weavers could easily introduce elaborate color and texture patterns into fabric. 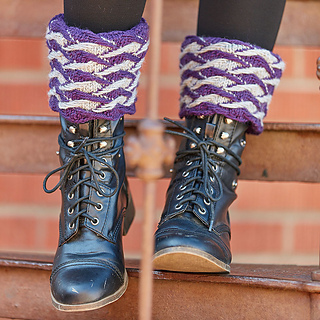 These boot toppers use slip stitches and contrasting colors to create a similar effect through knitting. Finished Size 12.25” circumference and 5.25” tall after folding down ribbing. 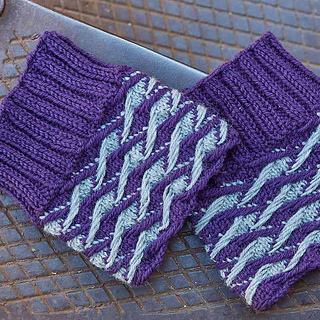 Yarn Patons Classic Wool Worsted (100% pure new wool): #00212 royal purple (MC) and #00224 grey mix (CC), 1 ball each. Yarn distributed by Spinrite. Needles Size 8 (5 mm): set of double-pointed. Adjust needle size if necessary to obtain the correct gauge. Gauge 23 sts and 42 rnds = 4” in charted patt. 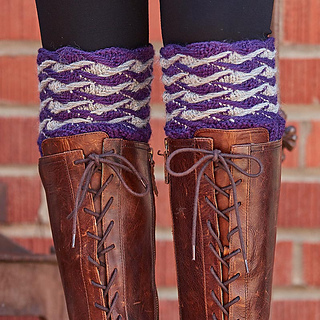 Note These boot toppers are worked in the round from the bottom up.